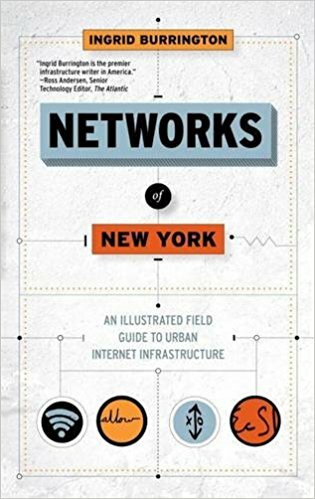 Networks of New York: An Internet Infrastructure Field Guide. Ingrid Burrington. Melville House Publishing. 2016. Now that terms like ‘the Cloud’ have entered the public lexicon, this is probably the type of book that everyone should read. That’s because it successfully challenges the vague and misleading ways in which the internet is usually described: as if it is some extremely abstract yet complex apparition, floating in the ether of a secret Google bunker and yet somehow miraculously connected directly to the screen in your pocket. Instead, in Networks of New York: An Internet Infrastructure Field Guide, Ingrid Burrington illustrates (simply) that the internet is mostly just a bunch of wires in holes. And that often the most complex thing about it is trying to untangle the history of what companies have owned which wires and when. It is also a book that everyone could read, with just 100 pages of clearly written prose full of helpful little illustrations. Rooted in the concrete materiality of New York City, the booklet takes us on a brief tour of road markings, manhole covers, underground cables, boxes on street signs, cameras and a few big buildings that connect them all. If you know New York, then this guide is full of metal boxes and spray-painted symbols that you’ve probably seen before but didn’t pay much attention to. And unless you spend too much time looking at your smartphone, this will result in at least one or two expressions of ‘Ahh yeah those things!’ If, on the other hand, you are one of the seven billion people living in some other place, then rest assured that whatever the thing is, it almost certainly exists around you too: it just looks a bit different. Overall, this might be a rudimentary guide to such little mysteries, but its success lies in condensing a grand quest for truth into pleasingly basic words and pictures. Because of that, the book does not go into too much detail, and anyone left hungry for more might read the work of geographers like Stephen Graham (on internet infrastructure) or Erik Swyngedouw (on water). Both support a sort of overall notion that cities are the socio-economic product of flows – including of electricity and information – and that the materiality of supporting infrastructures are often physically as well as socially obscured: buried beneath the road; providing a masked experience of a service; fetishised like a commodity. However, there is a hint towards more complex issues within the guide, which points to the position of history in shaping whatever it is that the internet is today. This is the apparent role of many different corporations, patents and broader economic contexts in the provision of internet access. For example, consider the way in which the former Western Union Building at 60 Hudson Street has been involved in more than 85 years of communications provision: from being a worldwide telegraph exchange to housing special equipment for high-frequency stocks trading. Today it is one of the world’s most important internet exchange points. In this way, the book clearly demonstrates just how closely internet infrastructure retains its material relationship with other major economic actors and preceding technologies. Further still, a reference to the current installation of ‘dark fiber’ – fibre optic cable that isn’t immediately needed and isn’t being used, but which is sunk into the ground for a prospective sale or rental at a later date – demonstrates the way that the internet is no less susceptible to forms of speculation and rent than other markets such as housing. This makes sense too: just as private companies have come to play a greater role in the provision of energy or water, so too are they embroiled in fierce battles to monopolise the wires and pipes down which our emails, Facebook Likes and Twitter-trolling travel. But whilst all flow at the speed of light, this little booklet shows that they are no less vulnerable to hurricanes, financial crashes or lightning strikes than you or I. A few years ago it was declared that for the first time in human history, more than half the world’s population was now living in cities. The percentage of global internet penetration currently stands somewhere around 49-50 per cent, and is set to surpass the halfway mark very soon. This means that the future is both urban and connected. Internet infrastructure has never been more important, and understanding its reproduction and maintenance as a socio-technical assemblage is paramount. Overall, Networks of New York is a modest but highly significant contribution to research on internet infrastructure precisely because it represents such an accessible and enjoyable gateway into the field. Joe Shaw is a PhD student and research assistant at the University of Oxford and Alan Turing Institute in London. His PhD is focused on real estate data analytics, economic sociology and urban development. He recently co-edited a pamphlet on ‘Our Digital Rights to the City’ and tweets @hyperrealestate.